A variant on the optogenetics technique may give neuroscientists the choice of activating neurons with light or an externally supplied chemical. 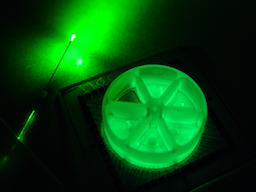 Bioluminescence from cells cultured in a multielectrode array, next to a fiber optic cable. Courtesy of Jack Tung. Biomedical engineering student Jack Tung and neurosurgeon/neuroscientist Robert Gross, MD, PhD have dubbed these tools "inhibitory luminopsins" because they inhibit neuronal activity both in response to light and to a chemical supplied from outside. "We think that this approach may be particularly useful for modeling treatments for generalized seizures and seizures that involve multiple areas of the brain," Tung says. "We’re also working on making luminopsins responsive to seizure activity: turning on the light only when it is needed, in a closed-loop feedback controlled fashion." In conventional optogenetics, scientists use genetic engineering techniques to make neurons in animals produce light-sensitive proteins called opsins. These opsins, which come from various algae and salt-tolerant bacteria, respond to a particular wavelength of light by moving ions across the cell membrane – thus stimulating or silencing the neurons where they are expressed. However, fiber optic cables, the usual mode of delivering the light needed to activate the opsins, have a limited reach into the brain, pose a risk of infection and can limit animals’ movements. To supply light locally and internally, the team took the enzyme luciferase from the soft coral Renilla, which glows in presence of its substrate luciferin, and fused it to an inhibitory opsin – creating a novel fusion protein termed an inhibitory luminopsin (from "luminescent opsin"). An excitatory luminopsin has been reported by other scientists, but its properties were demonstrated only in cultured cells. "We chose to do the rotation tests because they were simple and easy to measure," Tung says. "We also wanted to show that expression of luminopsin could be scaled up to multiple structures in the brain." The research was supported by the National Institute of Neurological Disorders and Stroke (NS079268, NS079757, NS086433).